So...I have become a full blow paparazzi! There is no "it" person or place that I am obsessed with, I just snap my camera every where I go. I am sentimental, so I want to capture everything. Similarly, I never want to let anything go. This leaves me in my current conundrum. Burn them to CDs? Keep filling up my iPhoto? Create more albums on facebook? While I continue to do all of these things, I realize that I need to find a place where I can find all of my photos in a time of need...rather than scrounge to locate the place of choice at the time of interest. 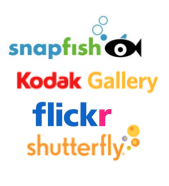 Flickr - Not the best venue for printing, album making, etc. iPhoto - Is there a way to create sub events? Or move old photos out of the main events page? It is getting a bit crowded! Also, this leaves my pictures on my computer without a back up. Picasa - I have been underwhelmed. Other? Is there a solution that I have not yet thought of? Give me as much feedback as possible, I really want to know! What system works for you? What is your favorite? Help me please! first thing i do is edit down the pictures. it was hard at first, but i realized i dont actually need to keep the 500 pictures of brooklyn i take on a daily basis, so i find my top few, and - brace yourself - DELETE the rest. it gets easier as you go along, trust me. i have't regretting hitting delete once. then you can actually focus on the best pictures, instead of being overwhelmed by a bunch that are just so-so. the next thing i do, is edit them is photo shop, picnik, or something like that. then, i upload them to kodak gallery - its just where i started (in about 2001), and i like having all of my pictures in one place, plus they almost always have deals going on, and if i want i can pick up my pictures in 1 hour at a bunch of local places. their quality of products is unbeatable - i have tried others such as snapfish and it just never measures up. also, kodak's iphone app rocks compared to others i have tried. i know you don't have one, but mark does. finally, because i am ocd, every 3-6 months i burn cds of my most favorite pictures (either on my own or through kodak). i also have a separate external hard drive that i only use for pictures, again as a backup (you can get a decent one for about $60-80, if you shop around online). hope that helps, although it really isnt that different from what you are doing already. i haven't found a better solution, so let me know if you come up with something!